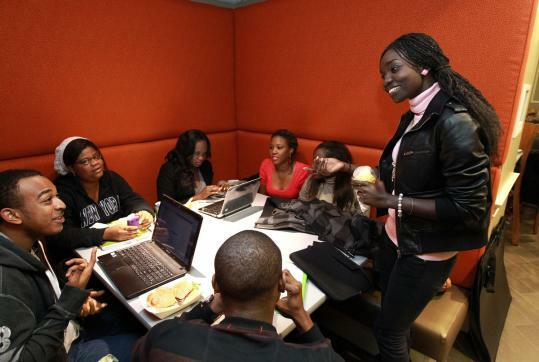 Pierre Du Jardin has infused his office at Suffolk University with the flavor of Senegal. Wooden masks hang on the walls, and Du Jardin’s soft accent evokes the official French language of the country. But if his 104 African students, all new to Boston this semester, do not feel quite at home on campus, it is hard to blame them. They would not be here at all if Suffolk had not closed its branch campus in Senegal last spring. Suffolk closed the satellite campus after losing about $10 million on the venture. It would be far less expensive in the long run, the college figured, to move its Senegal students to Boston. The shutdown is the latest of many. Over the last decade, universities spurred by dreams of global cachet - and, sometimes, by foreign governments eager to underwrite them - built or rented whole campuses and offered Western-style education abroad. But now some schools are running out of cash as they struggle to attract enough students and develop a viable business model. The most spectacular collapse of an international branch campus happened last year, when Michigan State University, failing to recruit even one-fourth as many students as planned, pulled out of Dubai after just two years in business. George Mason University left the United Arab Emirates two years ago, before its inaugural class could graduate. Troy University has closed three branches in the past year, in Guam, Sri Lanka, and Germany. Texas Tech University plans to shutter its own German outpost by 2012. That is only the American schools. Some British and Australian colleges have closed branch campuses, too. More shutdowns are likely, said Joseph Aoun, president of Northeastern University, which has not founded an international campus. A few leading US schools tried to establish foreign outposts decades ago. Harvard University founded a Chinese medical school in 1911 and a Swiss business program in 1973. Those early ventures were short-lived for reasons that are echoed today, said Jorge Dominguez, Harvard’s vice provost for international affairs. When Suffolk started its program in Senegal’s capital, Dakar, in 1999, 30 or so international branch campuses existed worldwide. But in the mid-2000s, the financial equation changed, at least for some. Wealthy foreign governments, especially those in the Middle East, started dangling multimillion-dollar subsidies in front of elite American schools. From 2006 to 2009, the roster of international branch campuses grew by 43 percent, according to the Observatory on Borderless Higher Education, a British research firm. Qatar drew an all-star list, including Cornell, Georgetown, Northwestern, and Carnegie Mellon. By 2009, the United Arab Emirates had 40 international branches. Middle-ranking colleges felt pressure to compete, even though some could not get foreign governments to pay their bills. The University of Nevada, Las Vegas, went to Singapore. City University of Seattle went to Switzerland. Troy, a public university in Alabama, founded 14 global branches. Not everyone shared that vision. Harvard, for instance, has not founded any international branch campuses recently. Neither did MIT nor Tufts University. Skeptics’ objections were not purely philosophical. Many were financial. The costs of sending faculty abroad can mount up. An enrollment of 100 or more can offset those costs. But that is hard to achieve abroad, where students with the right academic qualifications and the financial wherewithal may be rarer than at home. That was the case for Suffolk. The Dakar campus drew worldly and elite students from across West Africa, but could not attract enough of them. Students it coveted went to African universities, to France, or to schools in the United States instead. Some years, enrollment at Suffolk Dakar hovered around 60, far short of the goal of 110. The school lost $700,000 to $1 million a year. At the end of last semester, Suffolk finally abandoned Dakar. It did not, however, abandon its students. Almost all have transferred to Boston under a special deal that charges them $10,000 in tuition, the same they paid when attending the Dakar branch and about one-third what their classmates pay. Suffolk foots the rest. The students are adapting, though it is not easy. They dread winter and think the city’s buildings all look the same: impersonal. Some of their classmates have asked well-meaning but ignorant questions. Did they grow up living in trees? Isn’t Africa a great country? Though they are grateful for the break in tuition and the chance to come to the United States, they mourn their old campus. Many of the students plan to return home after finishing their degrees. Some say they still want US universities to open campuses in Africa, which the branch boom largely bypassed. At least one school plans to do so. Carnegie Mellon, which closed an outpost in Greece last year, announced plans last month to expand to Rwanda, offering a master’s degree in engineering financed by Rwanda’s government. The lure of international campuses still beckons to others, as well. Prominent schools in the Gulf states are thriving. New York University’s Abu Dhabi campus is cited as a model. Yale University is planning a branch in Singapore. Many hope to set up shop in India, though that country’s Parliament is stalling on letting them operate there.